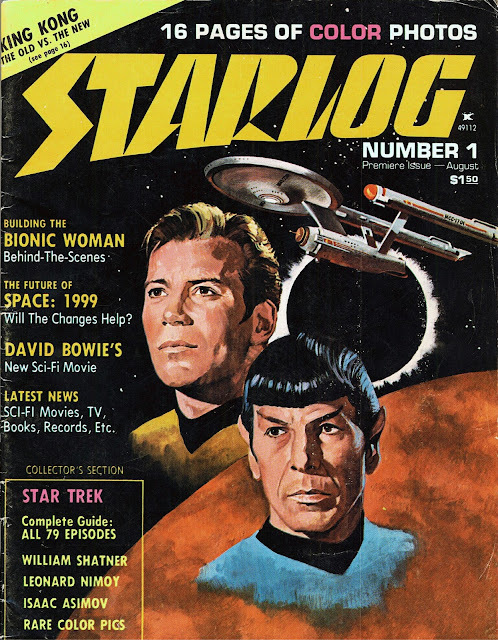 From August 1976: the very first issue of multi-decade Geek magazine mainstay (and regular source of posts for Starlogged) STARLOG. The (really nice) cover art says it all: this was concieved as a less-than-official STAR TREK magazine to cash-in on the ongoing reruns in first-run syndication. But the lawyers pointed-out that Paramount would sue if it was too obviously a Trek tie-in. So packing out the pages with other SF (pre-STAR WARS) was the best way of staying legit. I assume you own a copy of this ? would love to see some page scans.